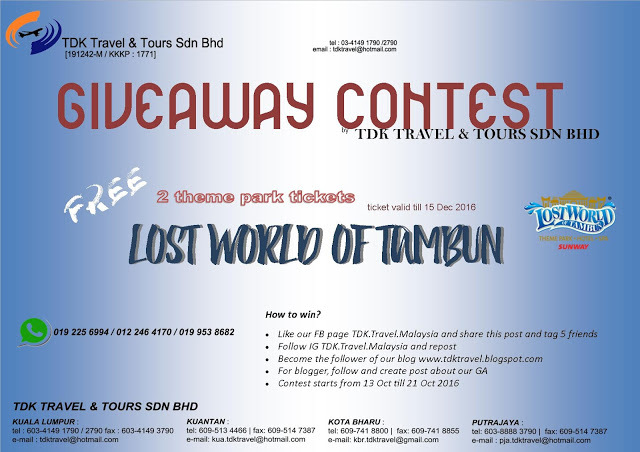 Klik banner untuk join Giveaway by TDK Travel & Tours Sdn Bhd | 2 Theme Park Tickets Lost World Of Tambun untuk dimenangi... Jom join Giveaway by TDK Travel & Tours Sdn. Bhd. 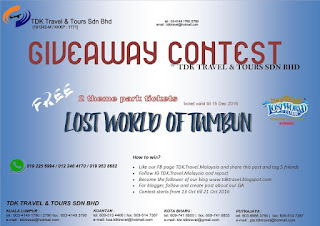 ni... Mane tau terpilih sebagai pemenang GA ni, dapat jugak bercuti di Lost World Of Tambun kan.. Sebelum tu jom tengok apa servis yang disediakan oleh TDK Travel & Tours Sdn. Bhd. ni..
OUR SERVICES TDK TRAVEL & TOURS SDN BHD We are a professional travel agency dedicated to promoting Malaysia and other destinations, while ensuring you quality and reliable service. WE GIVE YOU THE MAX! * * * * * * * * * * * * * * * * * TDK Travel & Tours Sdn Bhd provides a wide range of global travel management services that you can choose from. These include Worldwide hotel reservation, Ticketing, Inbound and Outbound Tours, Meetings and Incentive Planning, Tailor-made Tours, Car Rental, Ground Transportation, Student Placement Program, Student Summer Program and many more. With vast experience and capable travel consultant you can be rest assure of the success of your holiday in our handsHotel Reservation – Our long list of hotel accommodations range from three to five stars from Peninsula Malaysia, Borneo, Singapore and Worldwide. These hotels are among the best hotels in their categories for the good service, comfortable and value for money. * * * * * * * * Airline Ticketing TDK Travel & Tours is an IATA accredited agent and also linked to ABACUS, an online system that has more than 500 major airlines in its database. Being part of the system allows us to offer competitive airfare structure while retaining our quality service. We can deliver full-range and value-add your travels globally at your preferred budget. We also provide ticket delivery to offices or upon request to client’s address, even to the point of providing the best corporate rates for staff’s personal vacation travel and to offer lowest fare options with the best routing. * * * * * * * * Sightseeing Tours Our Day Tour and Overland Tour packages like the Malaysia on Wheels offer you an array of cities to choose from. You can take a tour from the heart of the city, climb mountains, stroll on beaches or even take the jungle trail with the Tours we have in store for you.Special Interest Tours – Whether if you like taking a good walk through Malaysia’s tropical rainforest with the Taman Negara Jungle Experience or get dressed in your adventure gear for the Mount Kinabalu challenge or simply be a part of the close-knit community of the Sarawak Iban Longhouse, TDK Travel & Tours is the place you are looking for. Just leave your company trip planning to us and travel with peace of mind. * * * * * * * * Meeting & Incentive Planning. Meeting. Regardless the size or capacity of your meeting, workshop, seminar or conference, you can rest assure that TDK Travel & Tours will complete your meeting management into detail from travel arrangements and even speaker support. No quantity is too large for our quality services. * * * * * * * * Incentive Planning. We provide comprehensive services in planning, organizing and scheduling the itinerary for your company business trips, seminar and conventions. Our teams of travel professionals are capable of planning any of your company’s annual/incentive trips within your specified budget. They will ensure all details are taken care of and that you will have the most memorable trip.Meet and Assist Services – You should not feel lost when you travel. With our meet and greet services for leisure tourists, meeting groups and even VIPs, you can rest assure you get the attention you deserve as soon as you arrive in the airport. Our teams of airport representatives are professionals and will be there to guide you along the way with the best courtesy.Limousine Transfer – Choose form our selection of Malaysian-made Car (Proton) to the luxurious Mercedes Benz for your transfers. The transportation can be charged hourly, daily or longer term, to ensure you receive the best possible rates and services. * * * * * * * * Self Drive Vehicle. TDK Travel & Tours works closely with numerous reliable car hirer companies for your self drive vehicle anywhere and anytime. * * * * * * * * Foreign Student Placement Program. TDK Travel & Tours welcomes International students to experience the education advantages in Malaysia. Our Foreign Student Placement Program have carved a reputation for placing students into quality tertiary education institutions that ensure graduates are equip with practical and industry-relevant skills. We will guide you with all preparations and relevant documents required to facilitate your entry into Malaysia and to furnish all information about our country. Your dreams comes true!. What is needed is to adapt to a new environment, culture and people. Quick update: I'm stil alive!